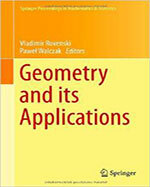 This volume has been divided into two parts: Geometry and Applications. The geometry portion of the book relates primarily to geometric flows, laminations, integral formulae, geometry of vector fields on Lie groups and osculation; the articles in the applications portion concern some particular problems of the theory of dynamical systems, including mathematical problems of liquid flows and a study of cycles for non-dynamical systems. This work is based on an international workshop entitled "Geometry and Symbolic Computations," held on May 15-18, 2013 at the University of Haifa and is dedicated to modeling (using symbolic calculations) in differential geometry and its applications in fields such as computer science, tomography and mechanics. It is intended to create a forum for students and researchers in pure and applied geometry to promote discussion of modern state-of-the-art in geometric modeling using symbolic programs such as Maple™ and Mathematica®, as well as present new results.